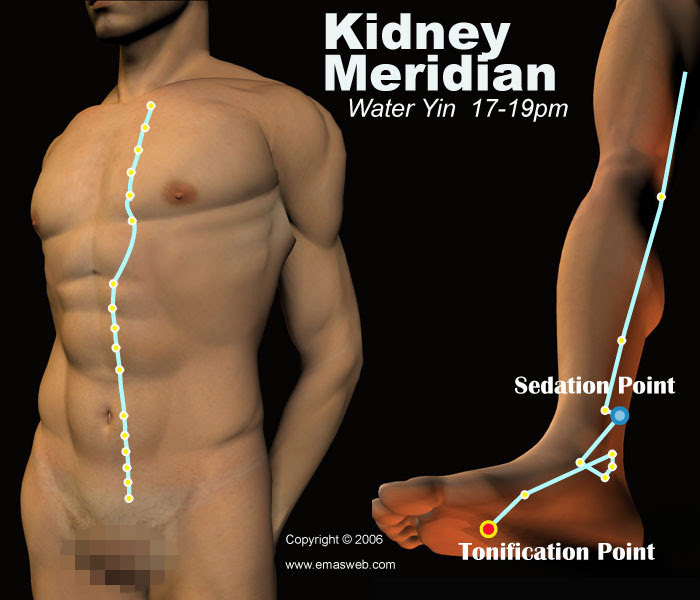 The Kidney Meridian connects with the Urinary Bladder Meridian, with which it is externally-internally related. The main functions of the Kidneys are to separate waste and excessive water from the blood, produce urine, and pass it outside the body. Besides the kidney organ, the Kidney channel includes the whole reproductive system, bones, ears, and some brain functions. So its abnormality may affect sexual and genital functions, the bones, and hearing. Symptoms which appear frequently, such as insomnia, vertigo, and memory loss, are due to abnormalities of the Kidney Meridian. The Kidneys receive qi, so symptoms of the kidneys include cough and asthma. The Kidneys govern water metabolism, so abnormalities of the kidneys will cause edema, constipation, abnormal defecation, and diarrhea. In addition, pain of lumbar region or throat shows an abnormality in the circulation of Kidney Meridian. Renal hypertension is caused by nephro-arteriosclerosis, which in turn causes angiostenosis. This has a considerable influence on the function of brain. Tinnitus is also a sign of abnormal blood pressure. *** Most kidney diseases are deficiency syndromes. Peak qi and blood flow in the Kidney Meridian is from 5:00 pm to 7:00 pm. 4.Diseases of the digestive system. 5.Diseases of the circulatory system. 6.Diseases along the course of the Kidney Meridian.